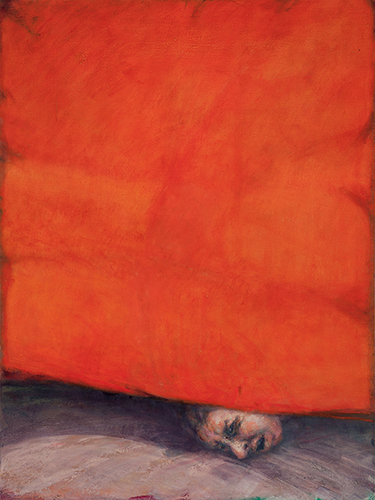 They were never an illustration of events, but rather, managed to capture the essence of the experience – the emotional charge and atmosphere, the geometry of bodies as they shifted wildly across the space, the stillness of the central figure, the unknowing expression on a performer’s face, the gate of their body in a moment of extremity, the abstraction of the process before it had found its shape, an unconscious, unmoulded layer of the work which an audience is able to perceive under the surface, but has never witnessed in its most naked form. Susan not only observed this strange, and very intimate process, but she became part of it. It became personal. 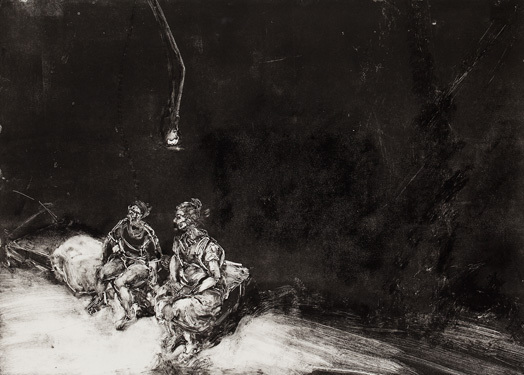 This collection of theatre paintings and mono prints is moving and profound. For me, it deals with the most essential dynamic of the theatre – the relationship between the human body and time. The theatre is a temporal art form which signals our mortality through its liveness; a medium which deals directly with the body, the flesh, the breath, the heartbeat of a performer. 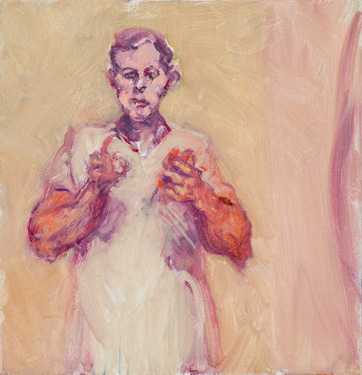 Susan’s collection, using the metaphor of the theatre as a springboard, captures the vulnerability of the human being before an indifferent god or audience. She portray human subjects wrestling with existential, ecstatic and invisible forces. Her figures are haunted, often in solitude, but always in contact with the dead. In her paintings, lonely figures emerge out of darkness, they haunt us, they linger in the mind. They posses a familiar but unnamable sorrow. They demand our attention, but they ask for nothing. To me, these works are unapologetic in the best sense, beautiful but unforgiving. They express the naked suffering of the human being in a world which forgets, dehumanises and exiles. 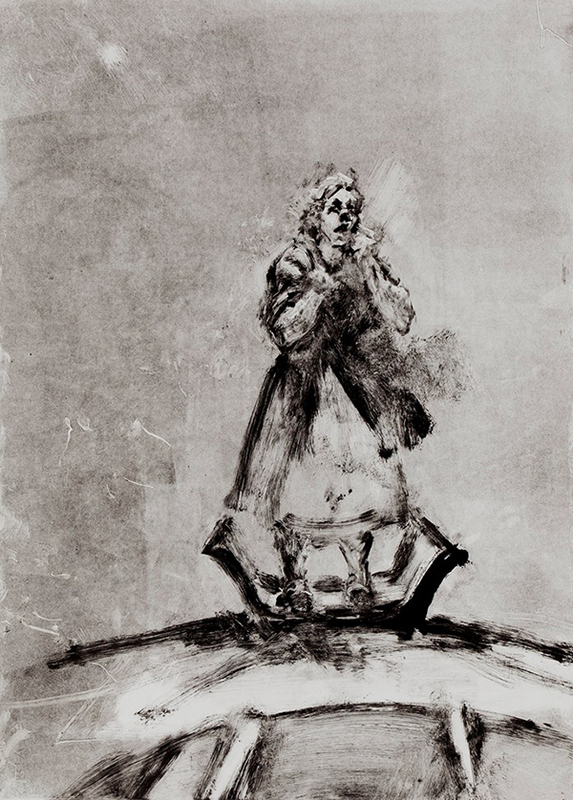 This collection of paintings and mono prints are inspired by Barrie Kosky’s Exile Trilogy performed in Melbourne in the ‘90s and also by Elektra, which was performed 5 years ago. On the closing night of a theatre production, the set, erected with so much care, and endowed with all this meaning, is irreverently pulled down by the crew, it very quickly is over, as if it never happened. Through this body of work, Susan continues to mine material which only exists in the mind. Although these productions are well and truly over, she continues a deep and personal investigation. To me, this collection is also, fundamentally, about memory and the desire for the immortal. Susan’s work is far more than an act of documentation. This collection, which memorialises, which is continuous, which is ever evolving, simultaneously captures the essence of tragedy, whilst refusing its inexorable end. Thank you to Susan for your collaboration and friendship, and for including me in your extraordinary body of work. Congratulations. I am honoured to be opening this show by Susan Wald today. For me, this collection is incredibly personal. I have known Susan since I was born, and over the past 5 years, Susan and I have been engaged in an ongoing artistic conversation. In 2010, Susan approached me and asked if she could observe rehearsals for a production I was preparing to direct. That production was Sophocles’ Elektra. I was drawn to Elektra because I was struck by the image of a woman who refuses to stop mourning. Elektra famously places herself on the threshold of her house and becomes a site of grief and abjection. She is told to move on, she is judged, punished and scrutinised, but all she can do is lament. A few weeks before rehearsal started, I went to Susan’s house to talk more about the project, and to show her a book of reference images I had been collecting. In the research stage for each production I collect up to hundreds of images which somehow relate to the work, but there is always one which instinctively is the most potent, or essential. In this case, I showed Susan the entire book and when she arrived at that particular image her face went white. She proceeded to take me into her studio and showed me the painting she had been working on. The relationship between the two were uncanny. For 5 weeks, 7 hours a day, Susan sat in rehearsals drawing. She became a kind of visual dramaturge, documenting the inner workings and sensory experience of the process. If a theatre production is difficult to describe, impossible to document, then a rehearsal process is even more amorphous. In the case of Elektra, we rehearsed in a tiny room in Carlton, where Sue and I were in very close proximity to the actors. This work, which was always meant to be performed for an audience of 30 people was primarily about the intimacy of looking. Why perform this tragedy today? What does it mean to invite people into a tiny room night after night to observe a woman’s grief? What is the role of spectator in all of this? What can the eye withstand? 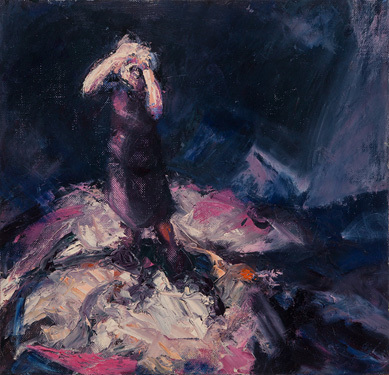 Susan’s presence was invaluable, and her gaze upon the performers became integral to the work, a part of the central metaphor. Sometimes I would joke that if she wasn’t careful she might end up in the show, drawing in the corner on stage. It was a dynamic based on deep trust. Her gaze was attentive and generous. She became a collaborator, inextricable from the process, a member of the company whose perspective was welcomed by the cast and creative team. 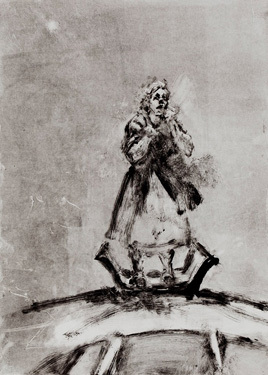 I, along with my collaborators, were often awestruck when we looked over our shoulders and glanced at Susan’s drawings.